Elegant is the word that comes to mind when describing the New Hazelton Lanes. It was built by York Hannover/Confederation Life in 1991 and is just north of Yorkville Avenue, opposite 4 Lowther Avenue on Avenue Road. 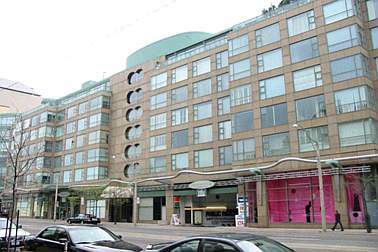 It’s a condominium complex with only 6 storeys but it incorporates 71 suites in a chic design. The cozy lobby is spectacularly and stylishly decorated, the building has extra wide halls with detailed doors and doorknobs, and the bathrooms and kitchens are furnished with the very best in appliances and materials. Prices are expensive and vary between $600 to $700 per sq. ft. but the suite sizes reflect that. The one bedroom units begin at 1050 sq. ft. and rise to the 4000 sq. ft. penthouses, and most suites also have a balcony. Ceilings are the average 9 feet high but the windows run the full height from ceiling to floor. This sensational condo at 77 Avenue Road also includes an extremely large common terrace, a party room, and full time concierge.